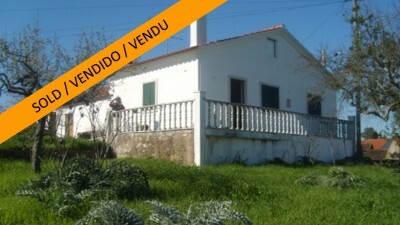 A property comprising three stone cottages with land for sale near Tomar, central Portugal. The property, which is connected to both mains water and electricity, has three old cottages, one of which has been restored, the other two needing to have renovation work carried out. The property is set on a plot measuring 9,000 square metres of land. Cottage One: The cottage is semi-detached to the other and is set over one floor. the cottage has been restored and has double glazed window with exterior shutters. The window and door surrounds are stone and the cottage has three bedrooms all of which have tiled floors. there is a rustic style kitchen, which has a traditional style fireplace to one corner. The living room also has a tiled floor and a corner stone fireplace with a re-circulating hot air Salamander log burner installed. Cottage Two: A semi-detached stone cottage set over one floor. This cottage does require more renovation work than the first, but is also connected to mains water and electricity. The cottage has two bedrooms, a living room and a rustic style kitchen and a bathroom. The bathroom has a shower, toilet, bidet and pedestal sink. Cottage Three: The third cottage is detached and does require the most amount of renovation work. It is set over two floors and has good views to the surrounding countryside. The cottage at present does require plumbing and electrics to be installed, but could be converted into a holiday rental cottage with a little work. The property comes with 9,000 square metres of land, some of which is situated on a hillside. There is a good selection of mature fruit trees and the property has a well with a water storage tank. There are neighbouring properties around and the closest village is situated at Póvoa, which has several cafes and a small mini-market. Póvoa is around ten minutes drive from the larger town of Tomar, which has supermarkets, shops, builders merchants, cafes, restaurants, health centres, schools, a weekly market, swimming pools and historic Convento do Cristo and Castle constructed by the Knight Templars in the 12th century. The closest airport to the property is situated at Lisbon, which is around one and a half hours’ drive from the cottage, though it is possible to utilise either train or bus for this journey. Lisbon airport is serviced by several low cost airlines which operate regular flights into and out of the United Kingdom and other European countries.